In here you will find all of this committees reports. Teddy bear gets a home! 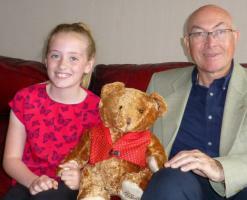 Sophia Wins Polio Bear "Edward" at the County Show Sophia Renaldy, aged 9, seen here at her home being presented with "Edward" by Clive Robertson, President Elect of the Rotary Club of Tynedale.